There are literally thousands of sleeping bags out there. They come in all shapes and sizes and are made with all kinds of materials, fills, zippers, and clips. Go ahead and google ‘best sleeping bags’ and you’ll literally get about 400 million results. With that kind of information overload, it’s difficult to find out exactly which bags are the best sleeping bags for backpacking. It’s overwhelming, to say the least! You’ve got brands promoting their own bags, experts testing and ranking the latest models, facebookers recommending their favorites like crazy on your backpacking group, and zillions of product reviews on every online storefront you check. 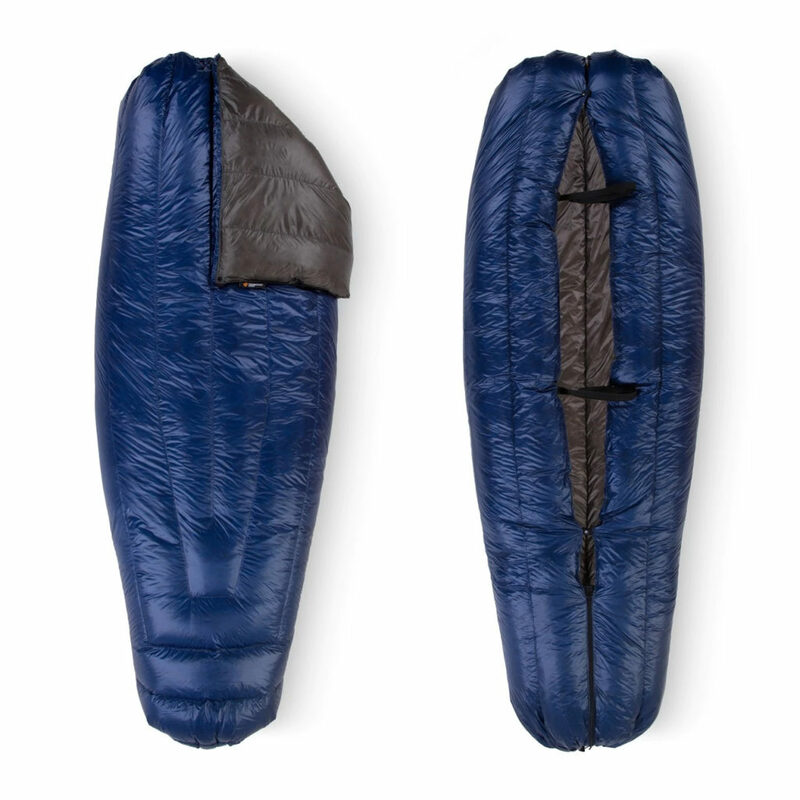 How do you sort through everything and decide which is the best sleeping bag for you? The top three sleeping bags recommended by real, everyday backpackers were actually quilts. In this review, we’ll check all three of them out in detail and follow it up in a later companion post with the top six sleeping bags that appear the most frequently in reviews from experts like backcountry.com, Outdoor Gear Lab, and REI. 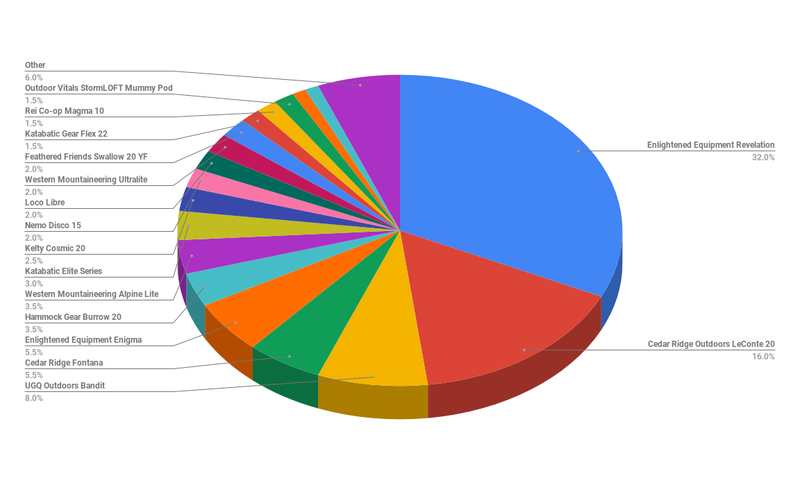 I took a poll asking backpackers around the world to recommend their favorite sleeping bag. Respondents could add their own sleeping bag, or vote for an option that was already listed. Two hundred backpackers responded and three choices rose clearly to the top. All three were topquilts as opposed to more traditional sleeping bags. If you’re new to quilts, they are a backcountry sleeping option that loses all the heavy and ineffective parts of sleeping bags. Quilts use systems of straps and clips that attach the quilt to your sleeping pad. The clips keep you covered but also allow you wiggle room for a comfortable sleeping position. If you’re like me, you move around a lot in your sleep, and one of the worst parts about sleeping bags are their restrictive nature. For this reason, alone quilts win big points in my book. You are able to leave the straps loose to allow more room while sleeping or cinch them down when the nights are cold. Quilts allow more versatility and adjustment for different weather conditions. With a whopping 32% of the total vote, the Enlightened Equipment Revelation was a clear winner. And it’s no wonder people are loving the Revelation. It’s light, warm, and versatile for a very reasonable price range when compared to most other sleep systems within the ultra lite market. On a related note, the Revelation has a zippered foot box. You can open it completely and use the quilt just like your comforter on your bed at home, or zip it up tight on the chilliest nights. The bag also has a drawstring around the next that allows you to cinch it up tight when you need to. The down used to fill this quilt is hydrophobic and will resist moisture and dry quickly if it does get wet. When I first heard about quilts, one concern I had was whether your backside is less protected and therefore much colder. And the answer is that even in a regular sleeping bag, the down underneath you becomes practically useless after it is compressed, so it doesn’t make a lot of difference. That being said, if you plan on frequently backpacking in temperatures that will dip below freezing (32ºF/0ºC) a quilt may not be a good option because it makes it a little harder to control heat loss. The temperature ratings quoted above, mean that you will be able to survive in those temperatures, but you will be far from comfortable. Stay tuned for a follow-up post that will include more traditional sleeping bags for those intending to backpack in extreme cold. Many have found the 20º Revelation Quilt to get cold at around the mid 30º range. I recommend adding around 20º to the enlightened equipment temp rating to gauge a better comfort level. 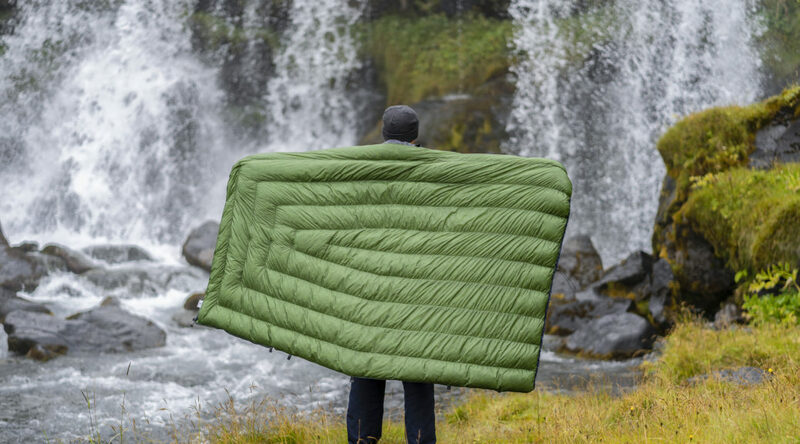 In any case, if you decide to go with the Revelation quilt, or any of the following options for that matter, be sure you have a warm sleeping pad, as that is what will provide the insulation and warmth for your backside. Weight: Depends on length, width and temperature ratings chosen. But it could be anywhere from 11 to 28 ounces. Cedar Ridge Outdoors opened in 2015 with the goal to bring top quality gear along with an excellent customer experience without breaking the bank. They are not a huge manufacturer and promise to work with customers to bring them the best, personalized gear possible. All Cedar Ridge products are handmade in Tennessee, and all materials are sourced from US companies. 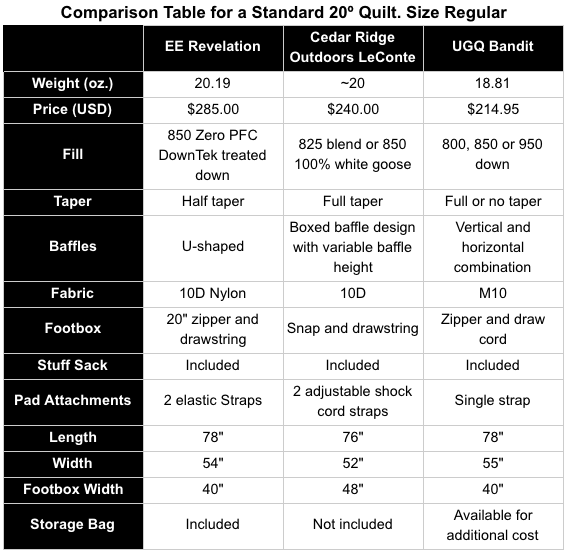 The LeConte Topquilt is completely customizable. Choose your own temperature rating, length, width, inner and outer colors, and even whether you want blended down fill or 100% goose down. The foot box is larger for a roomier, non-restrictive feel and can be either flat sewn or snap and drawstring. You can choose from over 50 different color/ custom print options for the outside of the bag, including some weird ones like jellyfish, raw meat, and watermelon. If weird isn’t your thing, don’t worry there are plenty of normal color options as well. The customizability is huge, you’ll have to take a look at the website to see for yourself. All that aside, by far the most compelling reason to buy a LeConte is the customer service. Backpackers who have gone with the Cedar Ridge LeConte Topquilt rave about the excellent service received from Warren at Cedar Ridge. If you’re unsure about the product features or what you really need for your personal sleeping style and backpacking conditions, he will not stop answering your questions until you are sure enough to make your choice. For this reason, many people prefer Cedar Ridge over Enlightened Equipment. If you want a quality, handmade, American made topquilt from a smaller business that cares about you and your individual satisfaction, the Cedar Ridge LeConte is an excellent choice. All Cedar Ridge products come with a 1-year warranty against manufacturing defects. They will replace or repair your quilt if there are any leaks, rips, or failures to meet your expectations. The handmade LeConte does require an 8-10 week lead time but if you need a rush order or shipping to a resupply point, Cedar Ridge will do everything possible to accommodate your needs. Bandit from UGQ Outdoors is also highly customizable. Just like the LeConte, the Bandit offers multiple temperatures, fill power, and length and width choices. They also have tons of fabric options, size combinations, and colors/ print patterns. UGQ pioneered this concept with a previous sleep system called the Renegade Quilt. The Bandit incorporates this concept as well as allowing for zone filling. This means you can add extra down into certain zones where you need it the most according to your sleep style. For example, if you often have cold feet while you sleep, you can order your Bandit with extra down in the foot box to provide for increased insulation in that area. The isolated chambers will keep the down where you need it the most! The bandit also has awesome foot box options. You can choose from the zipper and drawcord, a flat sewn – boxed foot box, or a lofty, fully insulated foot box if you’re expecting extra cold conditions. You can add a draft collar to help cope with the problem of heat escaping from around the neckline, and you can also choose either full or no taper for your quilt. UGQ Outdoors has managed to bring the lead time down to 3-4 weeks, not including shipping. However, this lead time is subject to change. You can check out the current lead time on the home page. They also offer fast track quilts that ship the next business day for those who don’t want to wait for custom quilts. Many backpackers reported that UGQ is no second-rater when it comes to customer service as well. They promptly respond to emails and are happy to answer all your questions. If you go with the Bandit topquilt, you can expect to join hundreds of satisfied customers. All three of these quilts have been recommended by many, many backpackers, who have tested them out on numerous backcountry trips. It is clear that any one of them would be an excellent choice for your next sleep system. I hope you have found this comparison review useful and, at the very least, a good starting point for your equipment research. If you have tried any of these quilts please leave your own review in the comments! And if you have any questions, leave them below and I will do my best to help you out. Very thorough review! I didn’t even think of quilts as a camping option but I will certainly look into this more when we go camping again. Yes, sleeping bags do tend to make me feel trapped. Especially when you need to go to the loo in the dark and you can’t get out of your sleeping bag! This article is so cool! I don’t travel so much right now because I have two little kids but my wife and I will eventually travel the world (that’s our goal). The description of the products are just perfect. You go over the details that matter the most for travelers and adventurous people that will buy quilts for backpacking. I will share this article with my wife because she would be the one choosing the one she likes 🙂 Thank you for sharing. Thanks for reading Victor, I wish you the best in your world travels. I’m heading out to Colorado in the next few weeks and super stoked to have found your post. I think the Cedar Ridge option would be the best option for me and I love the fact that it’s made here in the U.S. Tennessee! Whoohoo! My next step would be to see if they can have it made for me before I fly out! Go ahead and contact them! They do everything they can to accommodate people’s needs. I’m sure they can work with you. Thank you for considering us lilchefchic. We would love to talk to you about a quilt and help you build the perfect quilt for you. And thank you Mariah for the awesome poll! I like that Cedar Ridge offers a lot of customization, great customer support and a larger footbox that is important to me for comfort. It doesn’t bother me that they have a longer lead time and it makes me happy to support a 100% USA sourced company. Thank you for this comparison and heads up about using quilts for backpacking as the consensus recommendation. I like that you did a poll and are showing us the results. Thank you for reading Alexander. I’m glad you found the article helpful. Thank you Alexander, we are working hard to get our lead times down. We had a labor day sale that pushed them out a bit, bit we will hopefully be lowering them soon. I imagine that the prices are fair considering that this would be the primary sleeping place. It is like what you would be willing to spend on a bed, but that you travel with. The quality is seemingly great, again, it would have to be to 1) pay that much and 2) travel all over with it. You really seem to have gone all out here to be able to provide a concise and accurate review of these sleeping bags. I am not what I would call an avid backpacker, but I know people who are and I will certainly point them to this site. Please do! Thanks for commenting. This is a very detailed post about quilts for camping I personally am not a camping person never have done it but I found the post very informative I don’t think I would like sleeping in a bag also because I move around a lot, so I would choose a quilt. And there seems to be a wide range of colors, weight, and sizes. It is great to know that your backside would still be protected, if you are using a quilt. I like the Enlightened Equipment Revelation quilt. 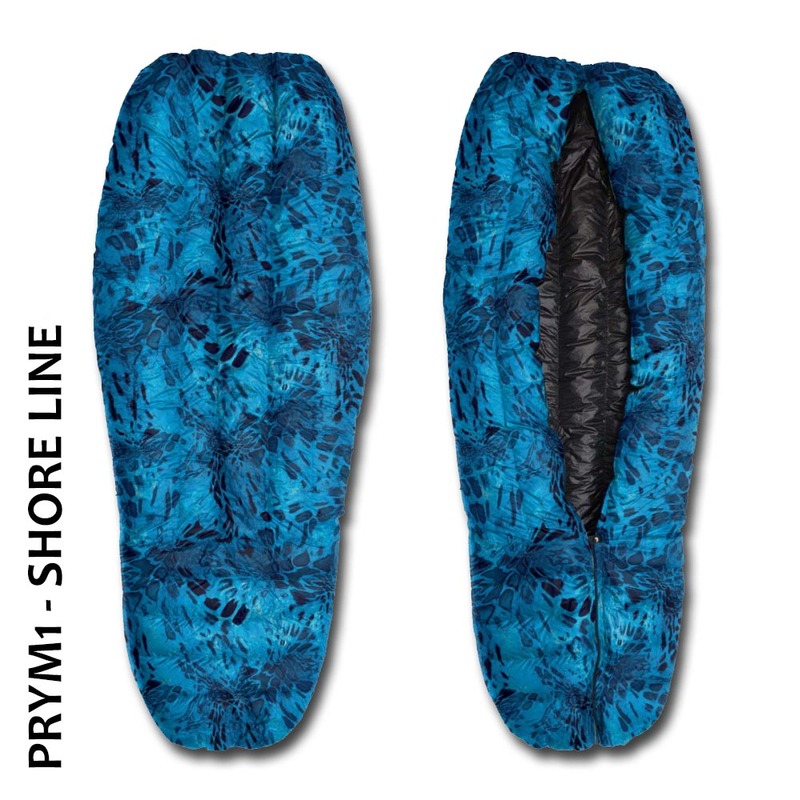 It is versitile and seems like it would be comfortable with the hydrophobic down, good brand and lightweight. It is good to know that it also comes with a warranty. Hey, I hadn’t heard of these until today! They look really cool. I know exactly what you mean about the restrictiveness of sleeping bags. I used to get really frustrated when I would try rolling over and it felt like the bag would get all tangled up. These look like an ideal solution to that problem! Sorry if I missed this part, but how easy is it to transport these? The one really redeeming feature of sleeping bags is of course their ability to be packed light and easily transported. How do these quilts measure up? You can stuff them really small into the included stuff sacks! And they are even easier to transport, because they are lighter than sleeping bags! This comparison is great help, I have a son, who wants to walk from Indiana to California and this review is going to really help me chose a Christmas gift for him. 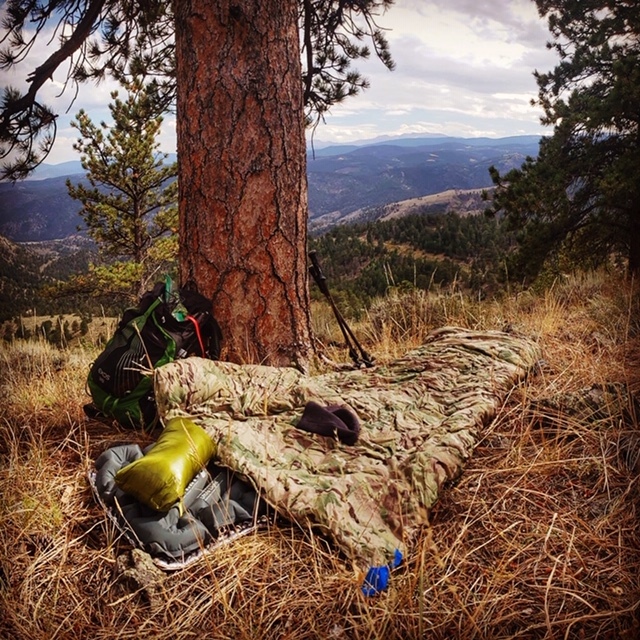 Thank you for finding the best options of sleeping bags, this article will also be helpful for hunters spending winter nights camping to get that early morning deer. Very true! Your son has an awesome goal, he is surely a two foot traveller. Check out the other reviews on my site if you want to see some more options that would be great, useful gifts for his trip. Excellent review on quilts for backpacking. I did not know that there were quilts for outdoor applications. As an outdoorsman, I enjoy pages such as yours. The one quilt that caught my attention was the Cedar Ridge Leconte Topquilt. It is great how there are customizable options. In addition, any product that is handmade and of quality always peaks my interest. All of these quilts are great options. Thank you. Thanks for reading Kenny! Hope to see you around the site again soon. Kenny, thank you. At Cedar Ridge we feel like the equipment you buy from us should be an extension of yourself. You can order what you need for your trip, but we want you to love it too. If you want an orange quilt with a pink inner…..thats what we want to make you lol. When you get something that is custom made for you, and is exactly what you want/need it will become your favorite piece of gear. I’ve gone backpacking a few times but had no idea that quilts were a better sleeping option. I know they make some pretty compact and lightweight mummy bags, but I hate feeling constricted during the night. Yep! If you take a look at the comparison chart you can see that all three options include a stuff sack. And a quilt will almost always weigh less than a mummy bag! The Bandit is a great choice. Wow. Your details descriptions of these sleeping bags make them seem like habitats unto themselves making a tent seem optional! Referencing them as quilts makes them seem approachable for a novice backpacker. As a more seasoned backpacker, I appreciate the weight details the most. Keeping a pack light is almost impossible for most people and every ounce counts! These are wonderful options to consider when I decide to get serious about getting back on the trail and I’ll be sure to bookmark this page for easy reference while shopping next spring! Jamming my comforter into my pack simply won’t do when these light and cozy options are out there to utilize! Thanks Casey, I hope you come back often!